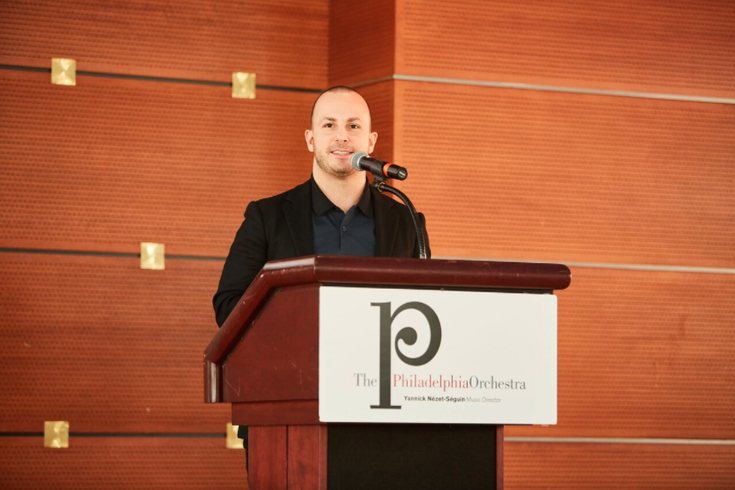 Philadelphia Orchestra Music Director Yannick Nezet-Seguin, who prepares for his first visit to Israel as leader of the orchestra, speaks to members of the press earlier this month. The Philadelphia Orchestra recently announced an historic international tour for this May and June, in which the orchestra will visit six cities in Europe, as well as three in Israel. The latter part of the trip, which coincides with the 70th anniversary of Israel's founding, will represent the orchestra's first visit to Israel since 1992 – the first visit to that country by any American orchestra since 1996 – and Music Director Yannick Nezet-Seguin's debut there. The tour was officially announced during a press conference inside the Kimmel Center's Hamilton Garden, and the orchestra brought along representatives from various sponsors, as well as Rep. Brendan Boyle, the congressman representing Pennsylvania's 13th Congressional District. All spread the message that the upcoming tour will be more than a series of concerts, but rather an act of "cultural diplomacy." "I am almost 7 years now [as music director], and it never gets old for me, seeing different styles of music played by talented people," Nezet-Seguin said. "One of the aspects of working with this storied orchestra that really makes me proud is this wonderful tradition of bringing the Philadelphia sound everywhere in the world. So this orchestra has a longstanding and very prestigious history of touring everywhere in the world." The tour will take the orchestra to Brussels, Belgium (May 24), Luxembourg (May 25), Paris, France (May 26), Dusseldorf, Germany (May 27), Hamburg, Germany (May 28 and 29) and Vienna, Austria (May 31 and June 1), before they head to Israel, where they will make stops in Haifa (June 3), Tel Aviv (June 4) and Jerusalem (June 5.) They will be joined by pianists Helene Grimaud and Jean-Yves Thibaudet for selected dates on the tour, as well as organist Paul Jacobs. While embarking to Europe and Israel, the orchestra will play selections by Schumann, Straus and Tchaikovsky, as well as work by Leonard Bernstein, in conjunction with both Bernstein's centennial and the composer's importance in Israel. Audiences back home will get to enjoy the performances too. The second Vienna concert and the Tel Aviv and Jerusalem performances will be simulcast on WRTI (90.1 FM), and hosted by Gregg Whiteside. The Jewish Federation of Philadelphia helped bring about the Israel portion of the tour, which will also include meetings with musicians, students and government officials. As noted by Naomi Adler, president and CEO of the Federation, the organization also helped present Orchestra concerts with Israeli musicians in conjunction with the 50th anniversary of Israel in 1998, and the 60th in 2008. The Israel leg of the tour will also include a "patron tour," which will be catered by the famed Israeli-born Philadelphia chef Michael Solomonov. "My life's work is to help people in the United States and around the world experience the depth and distinct beauty of Israeli cuisine and I look forward to sharing an amazing culinary adventure with the guests on this trip," Solomonov said in a prepared statement. Other sponsors of the tour include Jefferson Hospital, the Philadelphia Convention and Visitors Bureau, The Neubauer Family Foundation, Constance Smukler and Team Pennsylvania.